Queen Victoria named Alfred Lord Tennyson the British poet laureate in 1850. He delivered this poem on December 9, 1854, six weeks after the Battle of Balaklava had taken place in the Crimea. The poem heralds and commemorates the courage and valor of the 600 British calvary soldiers who charged a heavily defended position against Russian forces. Here are a couple helpful historical notes before you read the poem. A "light brigade" was a British military unit. It was a light calvary troop that could and strike quickly. The horses were unarmored and the soldiers carried lances and sabres rather than the heavy guns of that era. A "league" was about three miles, so the charge was over about one and half miles of open ground straight into a fortified position. When can their glory fade ? The brigade was not entirely destroyed; 118 men were killed, 127 wounded, and approximately 60 taken prisoner. Only 195 soldiers were still with horses when the light brigade regrouped. As indicated by its name, a light brigade is suited to flanking and other maneuvers where speed is important. The unit was not designed to undertake a frontal assault on a heavily armed position -- nor should they have been making it. The original order was to prevent the Russian's from removing Turkish cannons from the field. But there was a miscommunication, and the brigade was somehow directed to make a frontal assault. The details of the miscommunication will remain lost to history, the officer that delivered the communication was himself killed in the first moments of the charge. 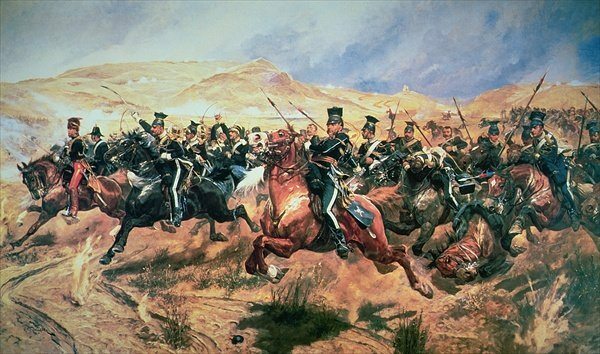 Add The Charge Of The Light Brigade to your own personal library.